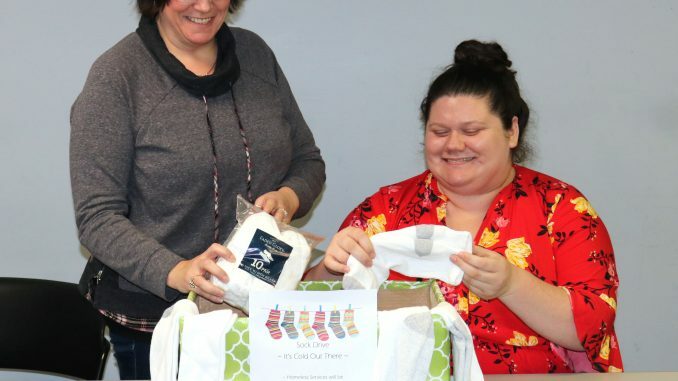 Beth Barlow (standing) and Molly Malone (seated) with OCO Homeless Services sort socks for distribution to homeless individuals in Oswego County. OCO is currently collecting donations of new socks at both its Main Office, 239 Oneida St. in Fulton, and in the Midtown Plaza in Oswego. For more information OCO Homeless Services contact 315-342-7618. FULTON, NY – Winter is here and as the temperatures drop it feels good to slip your feet into a pair of warm, comfortable socks. Beth Barlow (standing) and Molly Malone with OCO Homeless Services sort socks for distribution to homeless individuals in Oswego County. OCO is currently collecting donations of new socks at both its Main Office, 239 Oneida St. in Fulton, and in the Midtown Plaza in Oswego. For more information OCO Homeless Services contact 315-342-7618. Unfortunately, there are many in our communities that are unable to do so. For the homeless there is often not an escape from the bitter cold of winter. Oswego County Opportunities Homeless Services is currently holding a Sock Drive to collect socks for those that are homeless. OCO has drop boxes at both its main office, 239 Oneida St. in Fulton and in the Midtown Plaza in Oswego through November. For more information or to donate after November please contact OCO Homeless Services at 315-342-7618.